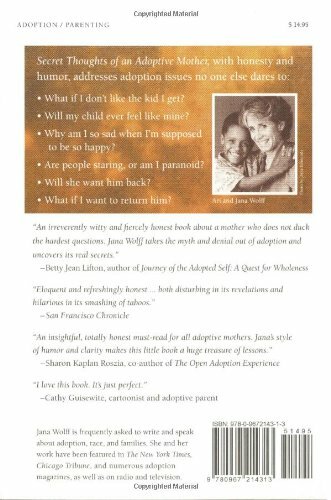 Categories: Open Adoption, Classic Adoption Books, Infertility to Adoption, Tapestry Picks, About Adoption, How to Adopt, Making the Decision. 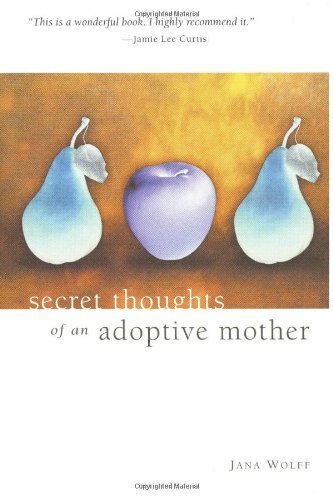 While books about adoption proliferate, none of them addresses the subject of open and interracial adoption like Jana Wolff’s personal and frank account does in [i]Secret Thoughts of an Adoptive Mother[/i]. Often irreverent, always insightful, surprisingly funny and stunningly honest, [i]Secret Thoughts[/i] tells it like it is: How it feels for a woman to look nothing like her child and to know the woman who does. This fiercely honest and funny book answers questions no one dares to ask: What if I don’t like the child I get? Will she want the baby back? If this is the happiest day of my life, why am I so sad? Am I too white for a kid this black? Chapter titles include: The Myth of Bliss, Friendly Racism, Meeting Your Child’s Mother, and Adopted Poop Doesn’t Smell Any Different.